Robot pets were the future once. Will we ever have faithful cyberdogs? Like all dogs, Ai and Doggy are slowing down as they get older. Ai is 15 and Doggy is 13; Ai doesn't walk so fast now, and Doggy's neck is stiff. That's a problem: because Ai and Doggy are robots and the robot vet has shut up shop. Ai and Doggy are Aibos, the robot dogs Sony made from 1999 to 2006. As the Wall Street Journal reports, Sony stopped maintaining Aibos last year; while owners get together to help one another with maintenance, parts are increasingly hard to find. That wasn't supposed to happen. Robot pets were supposed to be the future. What went wrong, and will we ever have digital dogs? If you pop into your local toy shop you might think robotic dogs are in rude health. The revived Teksta's robot puppies are cute in a plasticky kind of way, while the Zoomer dalmatian can do stunts. There's even a FurReal Friends "Walkin' Pup Pet". But these electronic dogs are just toys. We were promised pets. The difference between a toy and a pet is simple. A toy is a plaything, but a pet has a personality. A robot dog you control with a remote or that offers a handful of pre-programmed actions is fun, but you're not going to fall in love with it. But if your robot has artificial intelligence, you just might. That's what happened in Japan with the Aibo. By modern standards the technology inside the Aibo range was pretty crude, but it could sense its environment and respond to spoken commands. Software packages added personality and development: the Explorer package turned the Aibo into an adult "dog" that could respond to - or choose to ignore - 100 voice commands, while the Life package took the Aibo from pup to adult. Humans were clearly ready for robotic pets. While Aibos' appeal was largely limited to the Japanese market, virtual pets such as Tamagotchi, Nintendogs and every parent's nightmare, the Furby, were enormous global hits. It was just a matter of time before virtual pets became as popular as real ones. 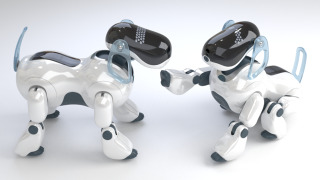 Sony killed the Aibo line in 2006. The company was bleeding money, and while the Aibo was heralded as the best consumer robot ever made it was expensive and didn't do huge numbers. Total global sales were around 150,000 - which is pretty good for a product costing the best part of $2K, but it wasn't good enough for Sony. "Our core businesses are electronics, games and entertainment," Sony said, announcing a swathe of cuts and the end of its robotics business. There hasn't been a mass-market product like the Aibo since. There's something wonderfully lifelike about the Aibo's design. Artificially intelligent dogs do exist, of course. We've all seen the videos of Boston Dynamics' (and now, Google's) Big Dog and Spot, the eerily lifelike robot dogs that we find faintly frightening. It turns out that we prefer real dogs to robot ones, and we'd rather have a stuffed dog than a silicon one. In a fascinating study published earlier this year, researchers found that while preschool children saw stuffed dogs as companions, they saw virtual dogs as entertainment providers. Another study found that Nintendogs couldn't compete with real dogs for children's affection. And for all the hype over Tamagotchi, many of them died when children lost interest - something wonderfully satirised by NewsThump. We don't treat real dogs like that, but owning a hound isn't always easy. You need to feed, walk and clean up after them, and keep the little tykes interested in the world around us. Dogs need time, space and money, and in our increasingly dense, increasingly urban environment we're often short of all three. When we all live in megacities, will robots solve the pet problem? Australian researcher Jean-Loup Rault thinks they might. Writing in Frontiers in Veterinary Science, he asks: do "new technologies actually represent the future of pet ownership"? As Rault explains, humans started keeping dogs as pets around 20 or 30 thousand years ago. The reasons for doing so are myriad: for some it's companionship, for others status, and for some it's a motivator to get out of the house. But there are also reasons not to own pets, including ethical ones - is it fair to keep intelligent creatures in what amounts to captivity, or to keep a creature born to be an athlete in a poky flat for hours on end? - and personal ones, such as owners' lack of mobility or allergies. For Rault, AI and VR present some tantalising possibilities for digital or virtual pets, and the latter isn't so far-fetched when you consider how many hours people have spent patting D-Dog in Metal Gear Solid V.
Battlestar Galactica's Daggits seemed pretty high-tech at the time. Honest. "The question is, what will be the place of pets in a digitally driven human society?" Rault asks. "Pets are common in Western cultures and on the rise in 'developing' countries such as in Asian countries. "Yet, it is difficult to imagine how more than half of the 9.6 billion people of 2050 could still keep pets… pets may become a luxury possession for people who can afford to sustain their cost and fulfill their needs in terms of space, social, and mental needs according to possibly higher ethical standards raised by future societies." Rault accepts that "at present, artificial pets can be described as mediocre substitutes for live counterparts." It's been nine years since the last Aibo left the litter. Imagine what one designed with today's tech could do.